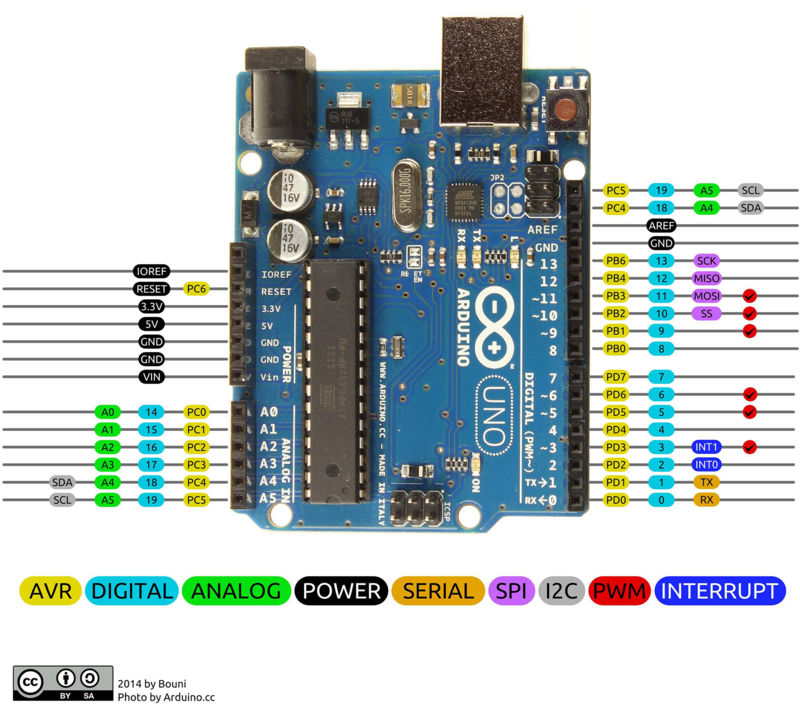 Arduino boards and the Arduino IDE are incredibly versatile and therefore are employed in a variety of applications. In education, they provide a low-cost physical “breadboard” for students to test sensor inputs, act upon those inputs, and then create an output to generate an action in the physical world. The traditional path of engineering design might require students to understand the entire 662-page datasheet of the ATmega328P microprocessor (PDF) just for the microprocessor itself. However, the Arduino platform allows students to jump ahead so they can quickly enjoy the physical results of their coding exercises. PORTxn selects the internal pullup resistor when it is used as an input. If set to an input, enable or disable an internal pull up resistor. From there, reading the value of an Input/Output (IO) pin is just a matter of reading the value of a bit in the pin-status register of the MCU. Writing to a pin is just a matter of setting or clearing a value in the status register. Setting a high value in software results in a corresponding high value at the external pin of the MCU. (The voltage of the HIGH GPIO output depends on the logic level used for the Arduino, typically either 5Vdc or 3.3Vdc.) Software instructions like this will result in a physical voltage change at the microprocessor pin in just a few instruction cycles. While you can code these register instructions directly in C, modern compilers like the Arduino IDE will give you the same fast instruction cycle result. In a typical microprocessor design, the time it takes for the engineer to look the register values up once and then code to the register value thereafter is well worth the performance improvements. In fact, traditional, pre-Arduino microprocessor development would have the engineer do this without a thought to the additional complexity encumbering the Arduino environment, which favors code portability and safety over concise, quickly executable code. Enable or disable an internal pullup resistor if the pin is being used as an input. The Arduino Setup and Loop blocks are like the microprocessor-based design method. In principal, this is good training for the new developer to understand that you need to follow the identical process. However, without understanding the underlying code of the Arduino IDE functions, the new developer can also be led astray. Performs a look up of the internal timer that’s used with a particular pin when you’re directly using the MCU for the chosen Arduino variant of the project. The timer is in use if Pulse Width Modulation (PWM) is being used for the noted pin (see above bullet). But in this case, we’re performing a digital read of the pin. PWM is not involved, but the standard Arduino IDE call wants to look up this value anyway. Checks to see if the result of the Digital-Pin-to-Port value is an actual pin that’s available for use in the selected Arduino MCU variant. This doesn’t change between subsequent digital read calls. In a typical MCU design, using an undefined pin is a mistake that will create some higher-level debugging, however such redundancy in coding isn’t typical. However, the use of redundancy in the Arduino IDE would prevent the program from locking up entirely if this undefined pin mistake were made, but would result in a huge hit to processing time. Digital write has all of the same overly safe but largely inefficient calls that are part of digital read, but digital writes provide even more inefficiency. Depending of the intended use of the Arduino, the Arduino IDE functions may be sufficient for what the user needs to avoid all the high-level coding…. just to get the desired end result. The portability of code across dozens of different Arduino boards is just one strength of Arduino IDE functions. On the other hand, Arduinos should not be dismissed as “hobby level” devices, as the same MCUs are used in commercial and industrial designs. Programming the MCU populating an Arduino can be just as efficient as programming a custom designed prototype, especially if the custom designed prototype hasn’t arrived yet from the hardware team.